With numerous cross-country areas, each with its own unique charm and terrain, both avid and novice cross-country skiers will find plenty of Lake Tahoe Nordic skiing adventures. Lake Tahoe cross-country skiing is a favorite pastime for locals and visitors alike. There are numerous cross-country areas, each with its own unique charm and terrain specific to the area. While in the Tahoe area, consider a Tahoe cross-country ski in open meadows, among isolated valleys, and up to scenic overlooks. Located at Donner Summit, a short distance from Lake Tahoe and Reno, the Gorge is currently North America's biggest skiing resort for cross-country skiers, offering thousands of acres of groomed and backcountry trails. Set against a backdrop of the Sierras, cross country skiers not only enjoy fantastic scenery and mountainous landscapes, but also world class facilities and amenities. When planning your Lake Tahoe cross country skiing adventure, consider the Tahoe Nordic Center, where high tech meets old fashioned skiing and orienteering. Unique to the Center, the trail system doubles as a treasure hunting system which incorporates an altimeter, weather station device, GPS, and cross-country equipment. Accessible from the top of the Northstar gondola, the newly expanded Cross-Country, Telemark and Snowshoe Center features nearly 40 km of machine-groomed, scenic trails. Lesson and rental packages are available for skiers of all levels. Offering 400 acres of expertly groomed trails, The Nordic Center at the Resort at Squaw Creek provides trails for both beginners and those more advanced. However, with 70% of the trails rated as beginner, it is a perfect spot for those wishing to learn to sport of cross-country skiing, either alone or with an instructor. Although known for alpine skiing, Kirkwood also offers Lake Tahoe Nordic skiing on over eighty kilometers of finely groomed cross country and snowshoeing trails. The highest trails climb as high as nine thousand feet, offering spectacular views of the Sierras and beyond. Although the trails are designed for every ability, the variety in terrain allows more serious skiers to enjoy climbing ridges, gliding across cliffs made of lava, and then hurdling along creek bases. The closest ski area to Sacramento, the Bay area, and the Gold Country, Eagle Mountain features trails in unspoiled wilderness with views of Sacramento Valley, the coastal range, and Sutter Buttes. There are a variety of trails for all skill levels. Situated east of the Sierra Crest mountain, not far from Lake Tahoe, Tahoe Donner features 4800 acres of well-maintained Lake Tahoe cross country ski trails. The terrain is variable, including the flat Eur Valley, the Home Range's undulating hills and the Sunrise Bowl trails system's wide open type bowls and steepening pitches. Spooner Lake Cross Country Ski Area provides Lake Tahoe cross country visitors with over 9000 acres of carefully groomed cross-country skiing trails. It is well known for its excellent scenery and outstanding amenities including two cabins appropriate for a rustic retreat and backcountry skiing adventure. Off the beaten path, Granlibakken offers true Tahoe cross country adventure with minimal crowds. Although the cross country and snowshoe trails are ungroomed, they are clearly marked. 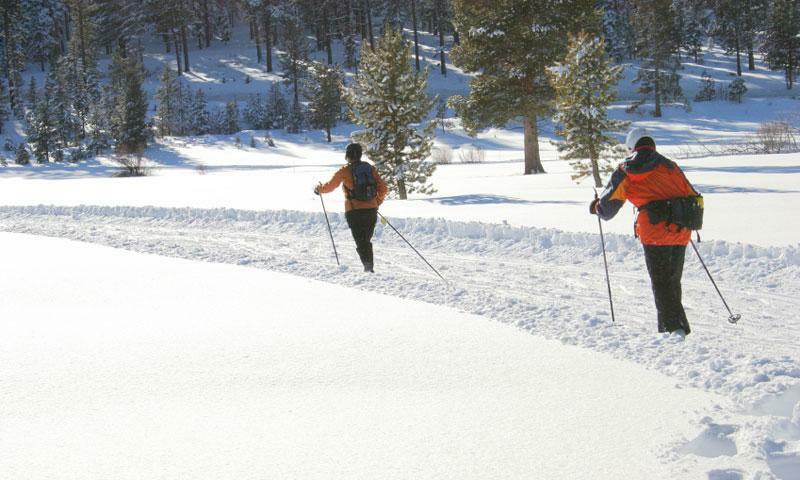 The Tahoe Cross Country Ski Area maintains Nordic ski trails in Tahoe City, California.